Final testing has been completed, students are looking forward to camp, prizegivings and various end of year activities - the teacher is awaiting a well deserved break. Before that I am working on analysing the data and reflecting on a most interesting year. 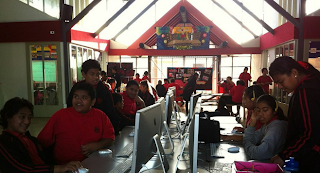 3rd year in a 1:1 environment using Google Sites to manage learning and blogs for sharing and reflecting. In the beginning my inquiry centered around key competencies, critical self reflection and students monitoring learning and success. 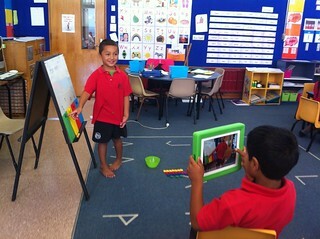 Nothing stays still for long at Pt England School and before I knew it term 1 was done. Things were going well, so we changed it all up. This in turn changed a lot of my thinking around my inquiry. I began to look solely at maths as an area to target as this was the subject I was responsible for teaching my 32 students. The students in class ranged in ability from operating at a year 2 level through to high school. A challenging task to engage and extend all involved. I started by looking at the idea of students working in multilevelled groups for problem solving, to learn from one another and strengthen skills of the more able students. I set difficult problems aimed at the upper end of intermediate school. Teaching equation strategies was not going to help these students, what they needed was targeted lessons around specific ways that would work best to solve the problems. 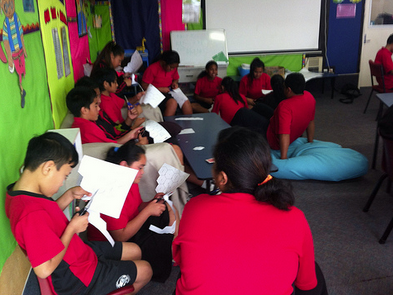 Each student brings strengths to a group and each student needed to identify those and how best to harness their abilities to support their own learning as well as the wider group. Some students clearly identified they worked best as an individual accessing learning from experts online, whilst others sought assistance from friends in the classroom. Some students knew that discussing ideas helped and others knew thoughtfully processing those ideas quietly was their best approach. Different strokes for different folks, all working alongside one another in a peaceful environment. What I enjoyed, as the teacher, was listening to students discuss and share their learning with others as they tackled the problem. 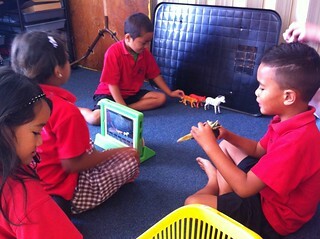 As well as the thoughtful sharing online between groups of learners. For many students the problem would always be much too difficult and would need to explore ways to assist them solving it. 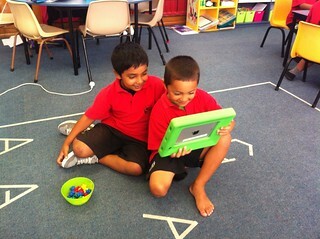 Each student shares their problem solving on their blog. This has proven to be a wonderful record for Overall Teacher Judgements, rewindable learning for the student and sharing learning for other students to access. Now, as I look to completing reports and generating my Overall Teacher Judgement on student achievement, I am also looking at the student's ability to self reflect and share learning. Ultimately, is there a direct correlation between accelerated learning and the sharing and reflecting on learning? For my class of 29 students I identified 19 who were competent sharers and reflectors. I took the data from student blogs, group activities and anecdotal notes from classroom experiences. Of those 19 students, 15 showed at least twice the national expected gain in mathematics over the year. The remaining 4 made 1.5yrs academic gain in 2013. Of the remaining 10 students who didn't demonstrate competency in sharing and reflecting, only 2 showed at least twice the expected gain in mathematics. Not a conclusive result, but certainly one that I am pleased with. Students that are cognitively engaged with the learning process are those making the gains. Those that regularly share learning are making the gains. Students in charge of their learning process are making the gains. These students are not always the traditionally smart kids - they come from across the board. I look forward to continuing this learning process in 2014. 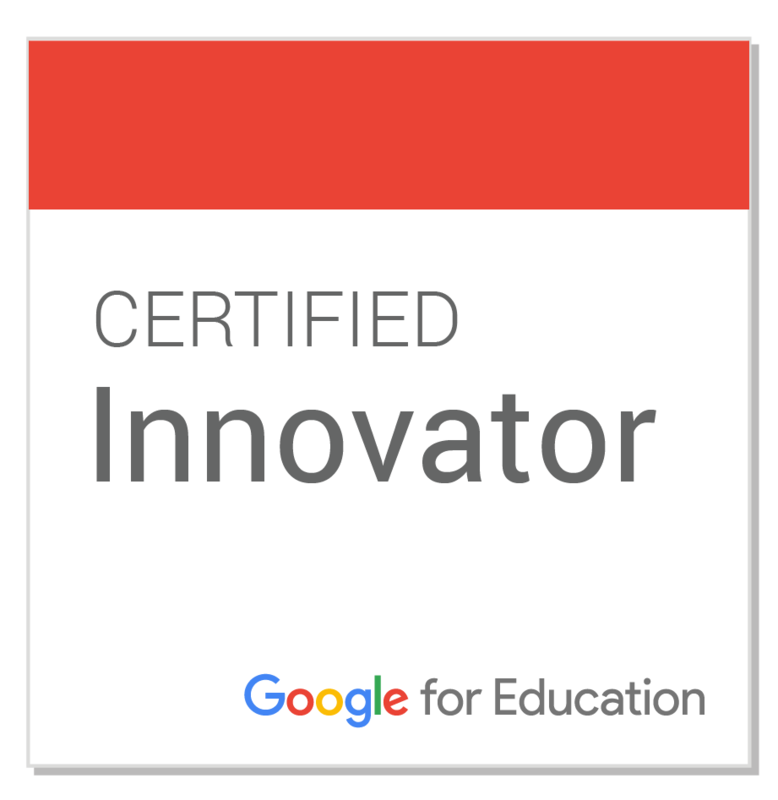 I will have a new group of students and a new chance to try and change the way they experience school and learning. 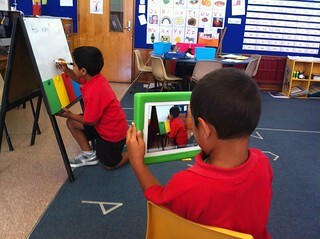 I will be teaching in a year 3/4 class in a 1:1 environment consisting of iPads and Chromebooks. An exciting adventure that I am keen to get started on. Thanks to the Telecom Foundation for this opportunity in 2013 and I am excited to continue this relationship for 2014 as a part of the MIT program. 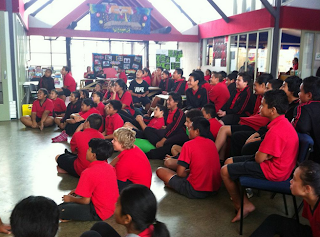 For literacy this term our intermediate school has been learning and discovering all about significant moments in history. In particular, one of the main focuses has been racism and civil rights. As a whole, the students have been examining the impact of Martin Luther King, Nelson Mandela, Rosa Parks and even Michael Jackson’s influence on race relations through song. 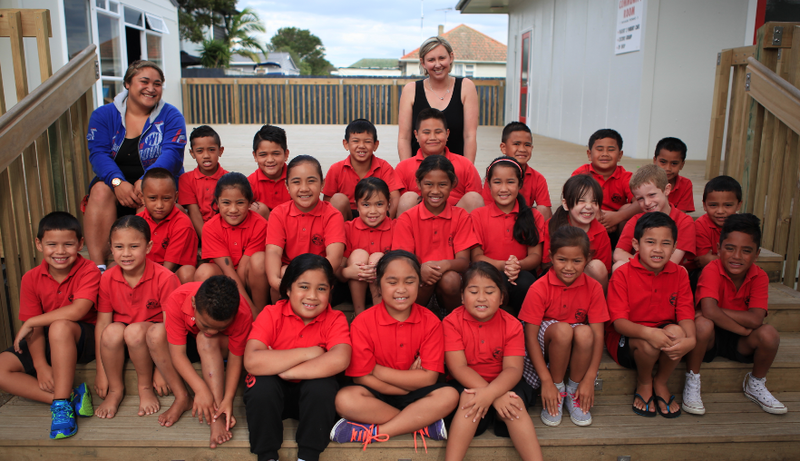 The learning, overall, has been powerful and the students have been strongly engaged with the content. 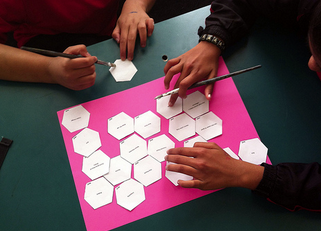 I’ve been thinking about thinking and reading more and more about hexagonal learning - via Chris Harte in particular. This model seems simple to implement, yet a fabulous means for getting the students to discuss, justify and even argue. As an introduction to this way of organising ideas and thinking, I took our topic of civil rights and racial inequality and put together 20 hexagons with a variety of words and phrases. To begin this idea for the students, I took the context of musical instruments and had them justify to a partner why certain instruments belonged together. There was much debate - even around a simple topic. 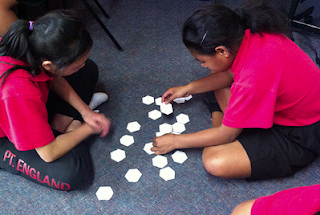 The basic instructions were to make sure that each group fully discussed and justified the placement of each hexagon and each group member had to agree on why it was placed there. The learning was around the discussion, the connections and the choices. 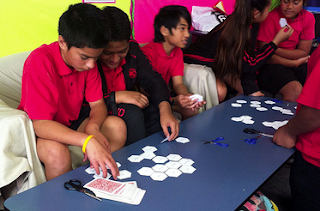 Because the students had been heavily engaged with the subject matter for 6 weeks before attempting this activity, there was no need to cover vocabulary or ideas. We jumped straight in. 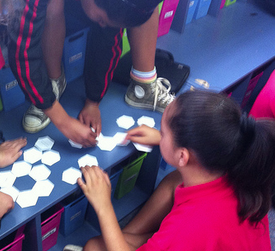 The first thing that struck me was how quiet they all were as each student thought individually through the options first - taking a small handful of hexagons and placing them together in different ways. Within 3 - 4 minutes the noise began, as I had hoped. Not one student asked me if they were doing it right! Yay! 20 minutes in and there was a clear divide amongst the students. Those who argued, those who discussed, justified and then compromised, and finally those who were happy to accept any answer. 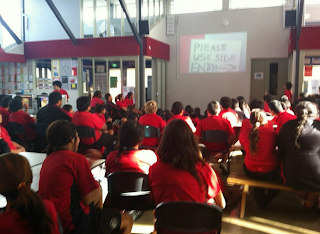 As I roamed around, I would deliberately point out interesting connections and have the students justify their choices - occasionally the students backed down straight away and removed the hexagon, but on more occasions they stood their ground offering some reasonable justifications. After 45 minutes the arguers were no closer to completing but had had some great discussions. The compromisers were scrambling to complete but had well thought out connections, and the acceptors had long since finished and were happy with what they had done. As the teacher - what a fabulous way to formatively assess the understanding of content knowledge, connections, relationships and their application. My next step is to have some of the more confident students record their justifications for others to hear and initiate further discussion around their choices. I see great potential in this strategy and will definitely be trying it again as soon as possible. I was fortunate as a kid to have an amazing teacher. A teacher who taught me that no matter how well you had done, you could always do better. Mrs Carter was my swimming coach. School and I didn’t get on. School wasn’t the place where I developed a passion to learn and achieve. Swimming took over my life. Swimming gave me direction. Swimming taught me to want to win. Swimming felt like I was flying, water was my sky, which I guess just made me some kind of superhero who had to settle for the nearest pool. Mrs Carter taught me that in life you only get one chance - so you may as well be truly excellent. She never had a harsh word to say or even an extreme sense of competitiveness, Mrs Carter just knew that the journey was never done and If you’re any good at all, you know you can be better. Achievements were celebrated, personal best times applauded and trophies awarded, however, you still knew that a pep-talk was coming and you still had work to do. Reflection became automatic and essential. We knew that if we were simply content with an average performance - then average was all we would ever be. With 5 x 4:30am starts each week and over 70km in distance to plough through - average wasn’t something I was striving for. School taught me that Just Enough - is enough. 50% to pass. Add those pretty borders and over utilise that lettering book. Not at one point did my academic education teach me excellence or give me the tools to strive to be the best. Through complete disengagement with the system, I skipped years 10 and 13 and still entered into a restricted tertiary course - by achieving "Just Enough." As I reflect on the opportunities I give my students to celebrate achievements and embark on next steps - am I encouraging or insisting on excellence. Is Just Enough still enough! Too often, as teachers we use fabulous and fantastic adjectives to describe attitudes or achievements without thinking about what we are saying. Was that outcome amazing? Really? I'm watching the students reflect on their creations, and those of their friends, and time and time again they are reluctant to be critical and are happy with simply having created something. Can we expect improvement if mediocre is what they are happy with? Or.... am I unrealistic? I have written before on the power of sharing and what it holds in motivating a student to share their best. I am beginning to question that thought. Yes, the students do want to look good in front of their peers, they want their peers to laugh and engage with their creation. Do they use reflection as a meaningful tool to improve and strive for excellence? I am continually asking and advising students to do something no-one has done before, to come up with purple cow ideas and stand out as doing something different. Each week 75 students surprise me by playing it safe and creating the same thing. 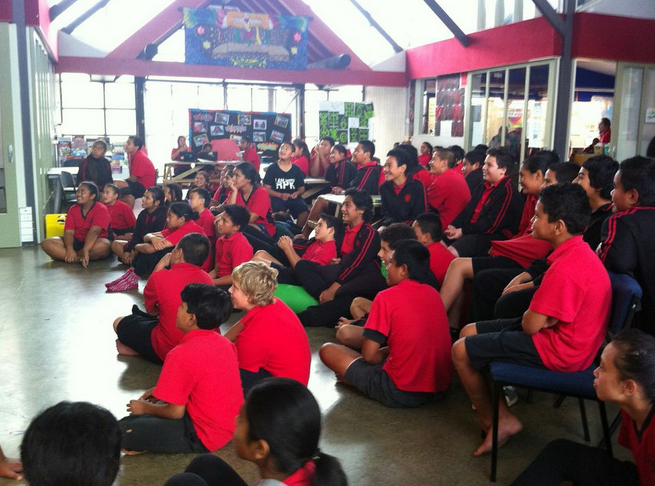 MTVs are the creation of choice at Pt England School and they are created well. The students have a wide range of filming, animating and editing skills and they are developing some much tighter and detailed plans and scripts. What they don't seemingly do well, is the extraordinary. My goal, through the use of critical reflection, is to have the students think much more carefully about their work and creativity. I want to see these very talented students branch out, be different and make incredible gains in their key competencies as well as produce quality products. 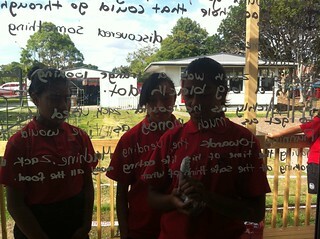 For the last 8 weeks our intermediate school of 5 classes has been trialling a new way to tackle literacy. I say tackle, as team wide we were struggling with how to incorporate great teaching, the need to accelerate our kids learning as well as addressing the creative, fun tasks that engage and motivate the students. The answer, we felt. lay in teaching to our strengths, small group rotation and working together. The students are split into two streams and each stream into 3 groups - making 6 groups in total. Odd weeks - Stream A rotate through fundamental literacy skills with 3 teachers - this means there are roughly 20-25 students in each group. Meanwhile, Stream B undertake the creative strand with two teachers. Much larger groups but less individual input required. Even Weeks -the streams switch over - the beauty lies here. 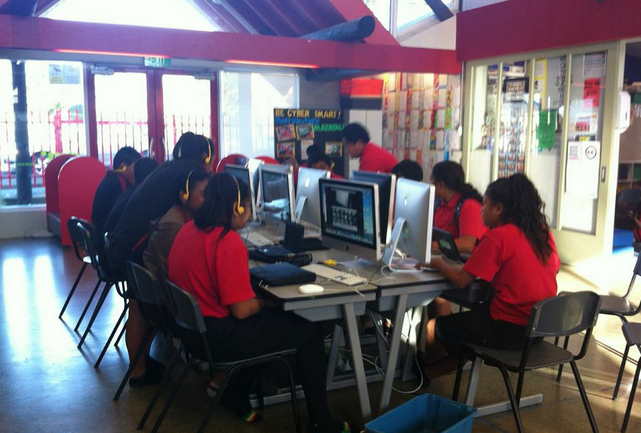 Stream A who spent the odd week writing and reading around a specific theme and genre now have the opportunity to create an artwork, movie or animation based around their literacy. As the teacher overseeing the animation and film creation I can often have over 50 students working with me. The engagement, self management and perseverance is evident when I have very little to do while the students are in the throws of creating. After a week in creative strand creating movies, animations and artworks the students are ready to share - Welcome to Friday afternoon. 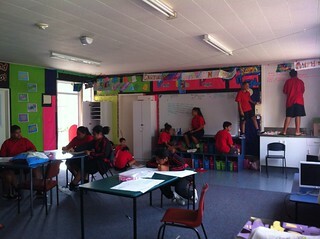 We have a communal space in our intermediate block named The Street. It is in The Street where we gather as a team to share the week's efforts. It truly becomes a showcase for all students and definitely a chance to show off and shine. These moments provide immense motivation to the following week's groups to work hard to better the previous creations. As with any new innovation there are challenges. How do we engage the students in the storyboarding and planning process? I perceive it to be a vital literacy to be able to to plan where your creation is headed. Outlining shots, angles and themes to best tell their story or share their message, is definitely the area of literacy we are beginning to focus more strongly on. 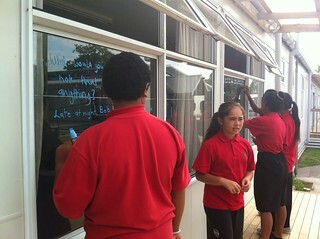 How best to ensure that students are being reflective and getting the most from their experiences? With only seeing children once each fortnight for a short space of time, we are currently lacking in time to effectively reflect and revisit the process from the creative week. By working closer with the other teachers in the literacy stream, we hope for the students to have the opportunity to reflect on their creations as a part of their rotation. This is something we aim to introduce as soon as possible. TKSD Movie Room15 from Team 5 PES on Vimeo. Rocky Wyatt Isara Shayne Love from Team 5 PES on Vimeo.